I frequently repeat my reservations and criticisms of the "Tetrapharmakos," for the reasons I stated in my 2015 post "Why I Think Epicurus Would Have Hated the Tetrapharmakon." Unfortunately from my point of view, this truncated passage is frequently pushed as a comprehensive summary of what is important to know about Epicuru. As a further effort to demonstrate that this text should not be treated as Epicurean gospel, I want to pull together in this thread everything I can find about where the passage comes from, who wrote it, the context in which it was found, etc. Wikipedia has the following graphic, which I presume to be in the handwriting of a researcher, rather than being a photo of the surviving scroll. As a start in this examination I would ask these questions: (1) Where is the original scroll? (2) Who transcribed these excerpts? (4) Is this text absolutely clear in the original, or as is frequently the case with the Herculaneum material, is some of the text "reconstructed?" (5) What if anything do we know about the text before and after this excerpt? This link provides a full list of the plates available for this scroll. So the place to start in analyzing the material before and after this text appears to be this page. According to Wikipedia, citing Pamela Gordon: "The "tetrapharmakos" was originally a compound of four drugs (wax, tallow, pitch and resin); the word has been used metaphorically by Roman-era Epicureans. to refer to the four remedies for healing the soul." The name cannot be traced further back than Cicero and Philodemos. Pamela Gordon, Epicurus in Lycia: The Second-century World of Diogenes of Oenoanda, University of Michigan Press (1996), p. 61, fn 85, citing A. Angeli, "Compendi, eklogai, tetrapharmakos" (1986), p. 65. This version is sourced to the Epicurus Reader, page vi. In my copy of that work, the page shows the same text quoted above, with a cite to papyrus 1005, 4.9-14. An image of that papyrus can be found here, and is shown below. So far I have not found any discussion of the translation process in The Epicurus Reader, so it is not clear to me whether Inwood or Gerson (who are listed as translators) or Hutchinson (who did the intro) are responsible for the English summary. In my last post (on Key Doctrine 6) I noted that the Epicurus Reader has a translation of Key Doctrine 6 that diverges significantly from that of other authorities. 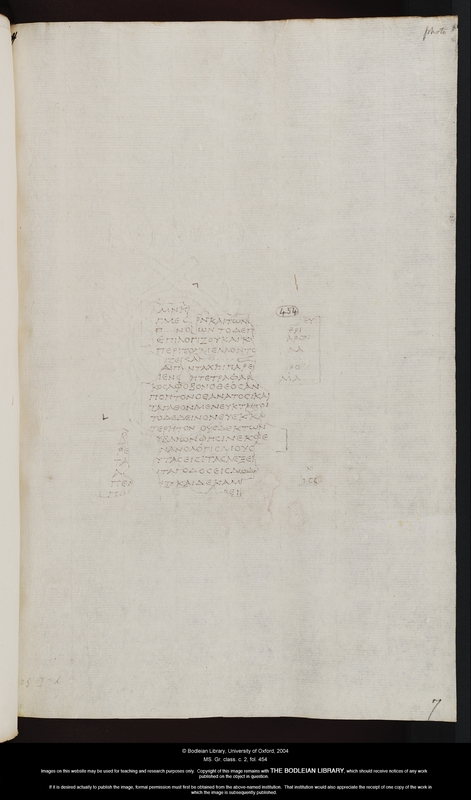 Thus I am curious about the context of this translation of the Tetrapharmakos. Clearly much is missing, but since I do not know Greek I cannot determine to what extent these lines are complete and to what extent they are conjecture. Likewise, I cannot determine the context in which they appear on the page. I am informed that by a number of readers who know Greek that the translation is probably accurate, and at least as to these four lines (but not the context) we have the full text. Thus the question to keep in mind in researching this is largely the context in which it was written. There is probably much we could learn from Philodemus’ thought process if we knew the context in which he (or the writer from which he might be quoting) reduced the first four key doctrines to these brief lines. What is missing from the record is any explanation or context in the papyri itself, so we cannot know what Philodemus intended to convey through or about these lines. What I will argue here, in brief, is that taken as they are today as a summary of key Epicurean doctrine, they are *absysmally* bad. (1) “Don’t fear god” is a woefully incomplete summary of PD1, which reads in full: “1. A blessed and indestructible being has no trouble himself and brings no trouble upon any other being; so he is free from anger and partiality, for all such things imply weakness.” Far from simply not “fearing” the gods, PD1 tells us that we are equally not to look to them for reward (“partiality”) or any intervention from them whatsoever. To say simply that we should not “fear” gods is to omit the key foundation of Epicurean theology – that perfect beings bring no interference **of any kind** to lesser beings. Gods do not create universes; gods do not destroy universes; and gods ask nothing of us and offer nothing to us whatsoever – certainly not a heaven or any reward whatsoever for our actions. “Fear” is only a small component of this key insight. (3) “What is good is easy to get” is a superficial cliche that has turned more people off to Epicurean philosophy than any other (except for the next cliche in the tetrapharmakon, which follows immediately). Everyone knows how much effort is required to live happily, and how the slightest slip can lead to disaster. And when “everyone” knows something, that means Epicurus knew it too. And so when we check the text we find this clumsy cliche bears no resemblance whatsoever to the full text of PD3: “3. The magnitude of pleasure reaches its limit in the removal of all pain. When such pleasure is present, so long as it is uninterrupted, there is no pain either of body or of mind or of both together.” Legions of stoics jump to the opportunity to argue that Epicurus held that “removal of all pain,” and nothing more, is the complete definition of the good life. The trouble is that this interpretation ignores the philosophical background of why “limits” were held to be important. As Seneca recorded in discussing Epicurus, “Natural desires are limited; but those which spring from false opinion can have no stopping point. The false has no limits.” Epicurus knew this was a carryover from Plato (see Philebus), and that those who argued against pleasure held that pleasure could not be the guide of life because it had no limits, and thus could never be satisfied. With this context in mind the meaning of PD3 is clear – Pleasure DOES have a limit, and it is reached when we succeed in filling our lives so full of pleasure that no room is left for pain of any kind. Cicero expressed this Epicurean doctrine concisely, “nothing [is] preferable to a life of tranquility crammed full of pleasures.” PD3 has nothing to do with “good” being “easy to get.” Stripped of its Stoic misinterpretations, PD3 can be seen to be of the same level of profundity as the discussion of gods and death: it is a statement that PLEASURE is the guide of life, and that this guide of life can be achieved by those who follow pleasure intelligently. (4) “What’s terrible is easy to endure” is even more outrageously false than the third line of the tetrapharmakon, and no amount of dancing around the point is enough to convince an honest student that a man to whom such a doctrine was attributed could be wise. Epicurean texts are full of appreciation for the difficulties and pains of life, and for the tragedy of those “hearts in darkness” who live in fear and doubt. Yet some would have us believe that the same Lucretius, who was compassionate enough toward animals to describe at length described the pain felt by a cow on loss of her calf, would advocate a philosophy where the pains of human life are held to be “easy” to endure. Once again the fault is in the summary, and in its interpretation, and not in the doctrine of Epicurus. Doctrine four reads: “PD4. Continuous bodily pain does not last long; instead, pain, if extreme, is present a very short time, and even that degree of pain which slightly exceeds bodily pleasure does not last for many days at once. Diseases of long duration allow an excess of bodily pleasure over pain.” This statement has little or nothing to do with “what’s terrible is easy to endure,” and for good reason. The numbering of the Principle Doctrines was not introduced by the ancient Epicureans, and there has never been any reason to separate the intent of PD3 from PD4. Taken together, these two doctrines fit hand in glove to establish not only that Pleasure DOES have a limit (the essential structure necessary to defeat the Platonic anti-Pleasure argument), but also that Pain is not to be considered as something to be avoided at all costs. How many times today do we see fans of Epicurus act as if “avoidance of pain” is far more important than pursuing pleasure? If Epicurus had in fact taught such a doctrine, he would have emphasized the severity of pain and the overriding necessity of avoiding it. But Epicurus knew what tricks the ascetic other-worlders were up to – he had the texts of Plato himself from which to learn. Thus Epicurus elevated to nearly the top in importance the observation that pain is NOT to be dreaded, and NOT to be allowed to cause us to shrink back from pursuing pleasure. The meaning of PD4 is not that pain is easy to endure, but that pain is WORTH enduring compared to the reward of Pleasure. It's my view that using the "tetrapharmakos" as a summary of Epicurean philosophy is a terrible idea. The phrasing is so truncated that it fails to convey Epicurus' original meaning and distorts the conclusions that many people will draw as to his intent. Further, the text does not come from Epicurus himself, nor does it come to us in an intact and reliable narrative by a recognized Epicurean authority. The flood of words devoted to the "tetrapharmakos"on the internet is all traceable to one source: a reconstructed fragmentary passage found in Herculaneum, written 200+ years after Epicurus, and attributed to Philodemus. It is my understanding that this four-fold summary is found in this form nowhere else in the ancient records left to us. Probably the best source from which to study the origin and condition of the text is at the Oxford University page linked in my post. On that page, images of **transcriptions** of the surviving pages from this scroll may be viewed. I would like to study this further so that I can revise my opinion, if warranted. If anyone who knows Greek has the time to look at these and comment, or anyone knows articles which have done this, please comment below. The reference in "The Epicurus Reader"
From Bernard Frischer, "The Sculpted Word"
Voula Tsousos, "The Ethics of Philodemus"
"A Conceptual and Theoretical Analysis of Fear" by Sergio Starkstein, including a reference that Long considers the tetrapharmakos encapsulates Epicurus' entire philosophy. Interesting. I always thought this formula was firmly associated with Epicurus. But it sounds like Philodemus was the one who coined it. But wouldn’t Philodemus have based this model on the teachings of Epicurus? And would we believe Epicurus would disagree with the formula? Maybe it was some sort of proselytizing tract that was formulated during those 200 years between Epicurus and Philodemus by other devoted Epicureans looking to give a simple “cure” to the world while Epicureanism was still flourishing. It’s clearly in the vein of Epicureanism. Whether or not Epicurus himself would’ve liked it or coined it himself. In my opinion, It’s a super simplified breakdown of the very basic tenants that kept (and keep) Epicureanism afloat. “Don’t fear the divine” According to E’s own specific theological doctrines, the very ones he promoted. This one makes sense to me as being very Epicurean. “Don’t fear (worry, obsess etc.) death.” This is also E’s doctrine and it ties directly into the first premise. There are no gods, no judgement, no afterlife. So when life ends, it’s just a cessation of sensation. So don’t “fear it” because there is nothing after you stop breathing. The last two are a bit more vague, but they are certainly a reference to the shortness of mortal life and the battle between pleasure and pain. “What’s terrible (painful)” doesn’t last forever and “what’s good (pleasurable)” is easy to obtain, because if you follow the Epicurean system, you would have the wisdom to know the difference between necessary pleasures and unecessary ones. I've thought of the tetrapharmakos as a pithy mnemonic for beginning students (such as myself) to get a basic understanding of the philosophy. For me, it's been helpful in that regard. That being said, a treatment such as this is a necessary step to a deeper and more nuanced grasp of the ideas. I agree with you Godfrey. I think the formula clearly has an Epicurean stamp on it. Whether or not Epicurus coined it himself. It’s not a “full” presentation of Epicureanism by any stretch. But it certainly functions as a brief reminder of the most basic beliefs. I mean it’s not like it’s possible that it would endorse anything other than Epicureanism. The first two premises are drawn directly from the first two PD’s! I've got the impression that the school of EP is considered to have followed Epicurus's thinking unusually closely through the centuries. But this topic is interesting in that it may be an example of a bit of variation in the doctrine and the potential ramifications of that, which I think Cassius is doing a good service to explore. Given the fragmentary remains of the documentation, it's great to see accessible studies of what exists and how it might fit together. Thanks for the comments above. Godfrey, in case I am not being clear, I don't really suspect that the phrasing indicates a divergence from Epicurus in Philodemus. Rather, what I suspect is that modern interpreters are reading into fragmentary remains something that probably is not there. My greatest concern after the fragmentary nature of these lines is the lack of context before and after in the scroll. Based on what I read in Philodemus in "On Methods of Inference" and "On Rhetoric" it was common for him to quote opposing philosophers and discuss opposing views. For all we know he could have been writing something with which he did not agree, so he could explain the problems with it. I agree also with the comments that there are aspects of the passage that are useful, even in prompting us to have discussions like this. It's certainly possible to interpret these in ways that are consistent, but I do question whether Epicurus himself would ever say that "what's good is easy to get" and "what's bad to easy to avoid." Those don't seem to me to be sympathetic interpretations of PD3 and PD4, or the way that someone who does have compassion for the suffering of mankind would talk, as Epicurus clearly had. So even if the translation and context are accurate, I'd question what is going on with this formulation. Oh I forgot this point - there really ought to be some leads in the rest of the text that is in this scroll, but I have no clue as to what the rest supposedly says, even on the same page as this "tetrapharmakon" text. That's the kind of research I'd really like to pursue, because somebody must know more detail about this text. Yes it does have its uses when wielded by the right hands, and it is so well known today that it has to be dealt with regardless of what we might think about it. I wish we had an example of an actual ancient Epicurean using it in context and explaining it from his or her perspective. Many of the passages that seem so tricky I think are perfectly understandable given the right perspective, which they would have had and of which we have been robbed for 2000 years. that are the God's little things. ( i.e. the little letters and the little things that we learn at school are derived from god and are ending to the god). So, that old song we have learned at nursery school stopped to the four letters, as four medicines means in greek the tetrapharmakos. And I wonder now where are the other letters of the greek alphabet ? Where is our alpha and omega that is pleasure inside the tetrapharmakos? It does not exist inside and that old song we sung in nursery school, and in the tetrapharmakos. Sorry guys, but inside wrong hands and the tetrapharmakos is like that old greek song we said in nursery school. That's the whole issue, I suppose. Every little and condensed issue, when you see it reading or hearing and is about the EP, as a honest Epicurean, you have to make it huge, clear, mature, grow, strong and obvious connected it with the real GOAL ! The formulation does have its uses, just like these rhymes do. But I think its grossly overused, and mostly by people who have no affinity for a pleasure-based philosophy. In fact, this formulation does not even mention "pleasure" at all, which is probably the main reason it goes down so well with those who interpret Epicurus as consistent with the Stoics. And one of the best ways I can think to caution people about it is to point out that we have ZERO-NONE-ZERO evidence of any Epicurean from 300 BC to about1800 AD (whenever the scroll was deciphered) ever citing this formulation in any intact text written by a recognized Epicurean. Even this text itself is (1) not intact, and (2) not without doubt written by Philodemus, and (3) even if written by Philodemus, we don't have his backup explanation for why it is good, rather than a child's rhyme. And even after 1800, we don't have the original text (just a drawing of a reconstruction) and we don't have any way to assess the accuracy or the mindset of the person who transcribed it. Nor do we know if the person who transcribed it would endorse the use being put to his transcription. I would be very grateful if someone reading this who is an expert can cite exceptions to the list of cautions I've just cited, but in my reading (which is pretty wide by now) I have not seen a single instance of it being cited, much less endorsed, by an authoritative proponent of Epicurean philosophy. Changed the title of the thread from “Diving Deep Into The History of The Tetrapharmakos” to “Diving Deep Into The History of The Tetrapharmakon / Tetrapharmakos”.